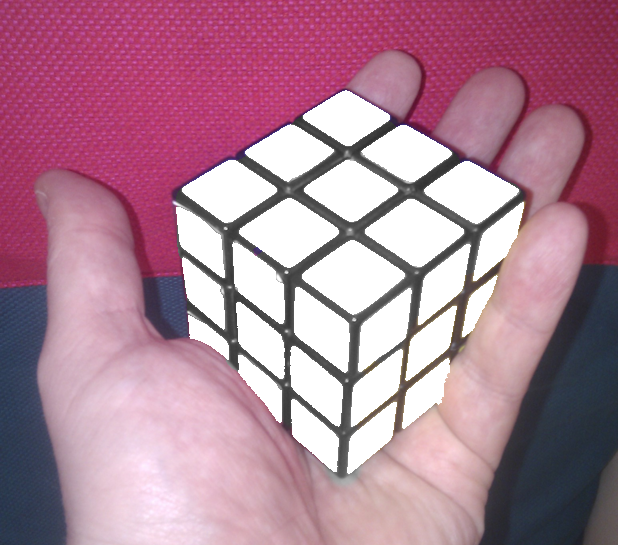 As you probably know, I'm an old hand at the Rubik's Cube. What could be more of a challenge than taking The Cube to the next level? Thanks for reading today's post; you're the best. My recent numbers have been great, and it's always a pleasure to see that spike in the stats when I post. But I'm curious because, beyond a handful of die-hard regulars who stop by the say hi, I've no idea who any of you are! If you feel so inclined (and as a one-time thing), why not introduce yourself? You know, who you are, what region you live in, whether you blog, and maybe the first of my entries you read? Or anything else you fancy telling me about. sadly my brain cells are constantly rubbing together, i fear if i tried this cube i'd short circuit and start a wild fire. Hi, my name's Darren, and I'm an alcoholic. For those of you who don't know me (which is probably most of you), Indigo and I are old friends (it's been almost 20 years!). He regularly visits my place in London, bashes the crap out of hideous monsters, then returns smugly to his penthouse flat. If you are interested in what I do, then I too have a blog - A Grand Life. It's a shameless plug, but I'm sure Indigo won't mind. Haha! I challenge you to a a duel. We will never know when one of us wins. Brilliant design (and you are too funny!). Hey Eolist! It's a tricky puzzle, it's true. But mind those chestnut locks of yours, we like them on your head. Hey Dazza! I thought I'd already added you to my sidebar of blogs, and commented to your most recent mail. Sadly, neither were correct, so I've put them right! Hey Kato! I accept your challenge. I'll go buy some more white stickers and the Race. Is. On. And thank you, tho I'm not as brilliant as your beloved; that was so coool! My name is Stacy, and I'm a lurker. I think I found you from Pearl, why you...'s blog. I can't remember what the first blog of yours I read was... I skim a lot (no offense) but I do remember I was attracted by your cool pictures. And your manly biceps. I live... in Mountain Standard Time. ... and that's all I can think of to say. However, I must say I love your new Rubik's cube design. I bet I could conquer that within 72 hours... with a few hints, of course. Hey Stacy! Aha, my first lurker! Welcome to the blog! But you SKIM?! *grits teeth* Well, that'll teach me to write long entries like this, I suppose: http://bit.ly/5H4utW; you'll never get through that one. But I can, of course, respect your love of manly pictures and these cool biceps. Hope to see you here again! Hey CatLady! Ha! I forgot you were a jailbird! I regard you as the first new friend I made here, and it wouldn't be the same without you! I like jigsaw puzzles, too, and would always have one set up if I didn't have a disruptive cat (like there are any other kind). But I'd never torture myself with an all-white one. There. You now know one thing about me that you didn't know before. I've decided to stop lurking and start following. Brace yourself - I don't follow and not comment - I may sound like an idiot, I may even look like an idiot, but don't let that fool you - I really am an idiot. At school I failed maths more times than I can count. I failed chemistry too because the teacher and I didn't have any um............rapport. I don't speak French but hey - cest la vie! I wonder sometimes if my wife is dissatisfied with my body? A tiny part of me says yes. Hi Jayne! I'm a sucker for a jigsaw. I recently went round a friend's house and annoyed his wife by putting one or two pieces in every time I walked past it. I'm not at all surprised you're a fan for some reason; I believe that's intended as a compliment. Hey Alistair! Welcome, Sir, welcome. I'm glad you've decided to take the plunge; there's plenty here to appeal to the unhinged. Aaah, DUCK SOUP, Groucho would be proud of you. Hello? Hi, this is Pearl, long-time reader. I live in Minneapolis, where seven months out of the year I live in a state of frozen/suspended animation. Please leave a message at the tone and I'll get back to you in April.